Today, May 17, marks the 64th anniversary of Brown v. Board of Education (1954), an event many have called a watershed moment in civil rights. On this day, more than six decades ago, the U.S. Supreme Court held that “separate but equal” facilities, as had been decided by Plessy v. Ferguson (1896), are inherently unequal and violate the 14th Amendment’s equal protection clause. Linda Brown, who was at the center of the landmark Supreme Court case —and who continued throughout her life to fight against racial segregation in public schools—died on March 25 of this year. She was 76 years old. In 1951, the NAACP recruited the then 9-year-old Brown’s family to join a class action lawsuit against the Topeka, Kan., Board of Education for maintaining segregated public schools, which effectively blocked black children’s access to education. Linda Brown’s father, Oliver Brown, had attempted to enroll her in all-white Sumner Elementary School, just a few blocks away from her home, but he was swiftly denied. 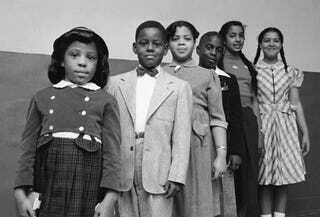 Linda Brown had to walk over a mile to get to the school designated for black students. Her father would become the lead plaintiff in the lawsuit that changed the course of public school history. Still, while celebrating this important legal victory, it’s also important to ask: Has integrating public facilities made lives better for black people in the United States? The unfortunate answer is no. Integration led to much resistance all over the country, but especially in the rural South in places like Georgia, Alabama, Mississippi, South Carolina and Virginia. According to the NAACP Legal Defense and Educational Fund, on Feb. 25, 1956, Sen. Harry Byrd of Virginia issued the call for “massive resistance”—a collection of laws passed in response to the Brown decision that aggressively tried to forestall and prevent school integration. Sometimes that resistance was violent, and many other times, it was covert, like redrawing congressional districts, gutting critical information from textbooks, creating new budgetary line items and erasing others. After integration, particularly in public schools, black people saw an uptick of racism. In addition, white parents have always found ways around the Brown ruling. This is particularly evident when they gentrify working-class communities of color but send their children to private or charter schools with racially biased admission practices. New York City, for instance, boasts one of the most segregated public school systems in the nation, with Mayor Bill de Blasio placing the blame on “historical housing patterns” in the city. Created during the mayoralty of Michael Bloomberg, New York’s choice system frees eighth-graders who once would have attended their neighborhood high schools to apply anywhere in the city. But many of the most desirable high schools seem to have washed their hands of all but the best-prepared students by basing admission on auditions, or scores on a one-day, high-stakes test, or top performance on statewide exams, or portfolios of middle school work. Others apply vague entrance criteria that leave a room for arbitrariness. By eighth grade, however, many low-income black and Hispanic children who have spent their early grades confined to failing schools—and passed through similarly poor middle schools—have already fallen too far behind in the competition for the high schools that could prepare them for college. If you want to test how progressive white people truly are, tell them that their precious children will actually have to share educational space with marginalized black and brown students. We see similar patterns all across the nation in “urban” school districts, which is code for “black, Latino and working-class” for a reason. We also see it in the South, where black students fill underfunded public schools, while wealthy white parents who have opted out of the public school system scream that modernizing buildings and implementing more technology is a waste of money. In one Mississippi town, a school board meeting grew so contentious, a resident threatened Philip West, a black school board member and former mayor, with physical violence. In truth, the entire charter school experiment is rooted in white supremacy and class hierarchy; it has proved to be nothing but a Trojan horse for segregation and has helped to erode any alleged Brown v. Board gains. Not that so-called integration has been any better for black Americans. In the 1950s and 1960s, many black Americans made their way through the court systems to constitutionally challenge racial discrimination. While the federal government began to address centuries of racial injustice in legal battles, the U.S. Congress also started to slowly address the realities of racism legislatively. Motivated by public outrage leading to the Montgomery, Ala., bus boycotts, to multiple church bombings, to the 1963 March on Washington, and the incessant violence against black community members and leaders, two laws were enacted, but not without controversy: the Civil Rights Act of 1964 and the Voting Rights Act of 1965. The Civil Rights Act banned discrimination in public facilities and employment, and the Voting Rights Act, enacted a year later, barred practices aimed at disenfranchising black voters. While these laws were passed a decade after Brown v. Board, they are critical in understanding the hostile climate facing black people in the United States and addressing why pushing toward integration seemed like the viable solution to ending white supremacy. These court cases and legislative victories only served to minimize de jure discrimination (legal segregation of groups enforced by law; e.g., Jim Crow laws enforcing discrimination in public facilities, such as schools and transportation) and did very little to stop de facto discrimination (legal racial segregation, especially in public schools, that happens “by fact” rather than by legal requirement; e.g., a high percentage of black people living in one neighborhood producing a majority-black school). In short, black people rightfully desired equitable public institutions—like schools—and wanted to make lives better for themselves and their families. For many, this meant packing their bags and moving into suburban communities, areas usually populated by white people. Like today, there was a belief that if black people moved into white-majority neighborhoods or school districts (which later led to “white flight”), we’d finally obtained a piece of the pie and were no longer part of a lower class. Respectability politics caused us to assume that we would be more accepted, and we were wrong. In the New York Times article “Integration Now, Integration Forever,” David Brooks reports on the benefits of integration, such as student outcomes in the long term and making America more diverse. Conversely, he also notes that integrating the country through the schools may have been a mistake, but only because he thinks housing should have come first. However, there is still noticeable racial tension and continued economic discrimination in housing for black families. In a recent study by the Equality of Opportunity Project, “Two Americas: Upward Mobility for White vs. Black Children,” it was found that black boys raised in America, even in the wealthiest families and living in some of the most well-to-do neighborhoods, still earned less in adulthood than white boys with similar backgrounds. Freedom, before and after Brown, did not secure an end to white supremacy, yet many are still pretending that it is connected to an American dream. The prevailing narrative is that school integration is not only ideal but is an essential means to creating equal opportunity for all children. Though not specifically said, what’s meant is that for black children to succeed, they need to go into better and more-white neighborhoods because success is usually linked to whiteness. It isn’t that advocates who are serious about school integration should not consider pursuing all strategies at their disposal, including consolidated regional school systems. History and the present, however, have just shown us that there is no purpose in continuing to push for it as a goal of progress or ending anti-blackness. It has meant letting go of safe spaces for marginalized and systematically disenfranchised communities and forced us to acquiesce to dominant groups—in this case, white America. It has led to the denial of spaces that are exclusively black, and though attempting to create a better educational environment for black students, integration oftentimes makes that environment more hostile and is counterproductive to black people’s academic success. My grandmother shared horror stories about how she and her peers were treated by their white counterparts. We see that, even today, just the thought of integration makes white supremacy rear its ugly head—and makes some black people dilute their own blackness to better assimilate into white spaces, and to hopefully remain safe within them. But that safety is a lie. We continue to live in environments where white people call cops on black people at the Waffle House, Yale University and a rented Airbnb. Lately, we are even getting to laugh hysterically at memes of the white woman who called the police on a black family attempting to enjoy a Sunday barbecue in Oakland, Calif. The facade of integration was that many believed that segregation was the problem and “diversity” was the answer. Integration isn’t the answer; it has never been the answer, which means that we are fighting the wrong evil. To be sure, many black people thought that “enemies” would teach our children the same as white children, but integration seemed to increase racism more than erode its white supremacist roots. Today, as we celebrate the 64th anniversary of Brown, we must acknowledge that the problem with separate but equal facilities isn’t the “separate,” it’s the inequities. After all, we can always fight for access to resources without linking that to being around white people and the systems that flow therefrom.